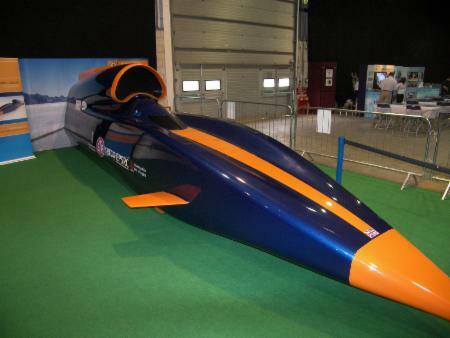 Hopefully the Land Speed Record will be broken again in 2020 by the Bloodhound SSC Project. 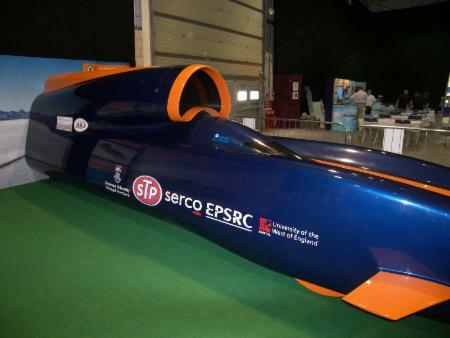 The Car travelled under its own power for the first time in October 2017 in Cornwall - at around 200mph. 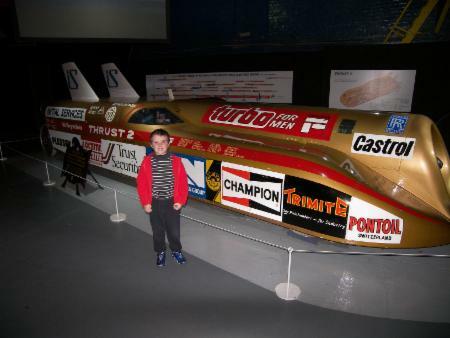 In November 2018, hopefully 500mph will be reached in South Africa, with the target of 1,000mph being attained in late 2019. Team members include Andy Green and Richard Noble. 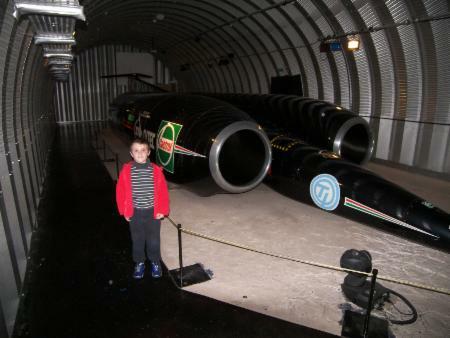 They have both set LSRs - Andy set the current record with Thrust SSC on 15th October 1997 at a speed of 763.035 mph, whilst Richard set the previous record with Thrust 2 at 633.468 mph on 4th October 1983. 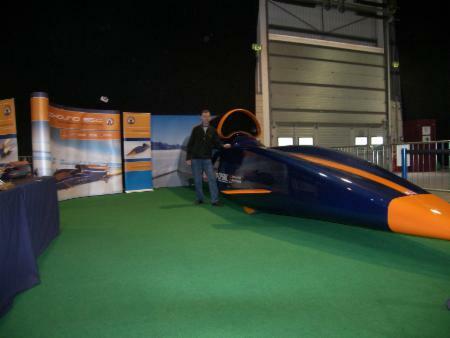 The Bloodhound SSC Team hope to set a record in excess of 1,000 mph (Mach 1.4). What an achievement that would be! The following three photos of the Show Car were taken at The Imagineering Fair at the Country Festival at Stoneleigh on 30th August 2009. It was good to see it and to have an informative discussion with the people on the Stand. The "real" car is being built in 2013/14/15/16/17/18. HRH Prince Charles became the longest serving Prince of Wales on 10th September 2017. He became Prince of Wales on 26th July 1958, with his Investiture occuring on 1st July 1969. When he does become King, he will be the oldest person at the time of their Accession. Currently this record belongs to William IV who was nearly 65 in 1830. Charles is already over 70. The final of the 64th Eurovision Song Contest will take place in Tel Aviv on 18th May 2019. HM the Queen and HRH Prince Philip will celebrate their 72nd Wedding Anniversary on 20th November 2019. Crossrail, in London, should hopefully be fully operational by the end of 2019. We were told that it would be called "The Elizabeth Line" on 23rd February 2016. HM Queen Elizabeth II will have reigned for 68 years on 6th February 2020. At the moment her reign is the sixth longest verifiable sovereign reign in world history. Tokyo will host the Summer Olympics from 24th July until 9th August 2020. This was announced on 7th September 2013 at the 125th IOC Session in Argentina. The choice was between Istanbul, Tokyo and Madrid. Coventry will be the UK City of Culture in 2021. This was announced on 7th December 2017. The next General Election in the UK is likely to occur in June 2022. Birmingham will host the XXII Comonwealth Games from 27th July to 7th August 2022. This was announced on 21st December 2017. The Finals of the 2022 Football World Cup will take place in Qatar from 21st November until 18th December. 32 teams will be involved. Paris will host the Summer Olympics from 2nd to 18th August 2024. They were elected as host city on 13th September 2017. The Finals of the 2026 FIFA World Cup will take place in America, Canada and Mexico in June and July, with 48 countries participating. This was decided on 13th June 2018. Phase 1 of HS2 (from London to Birmingham) may be completed by 2026. Los Angeles will host the Summer Olympics 21st July to 6th August 2028. They were elected as host city on 13th September 2017. 23 September 2090: The next Total Solar Eclipse to be visable in the UK. The last Total SE occured on 11 August 1999, though even in Cornwall it was cloudy!